It took her many tries to finally got this nest to stick and turned it into her home. This corner of my house was by the front porch, and close to the mail box. The wind had knock her nest off a few times, but she insisted and won the battle. I believe there are eggs in the nest now because she sat in it quite often, and I saw her there even in the early morning. I just hope that nothing will happen to it, and my mailman will be gentle with her there. Wow ! What beautiful photos ! 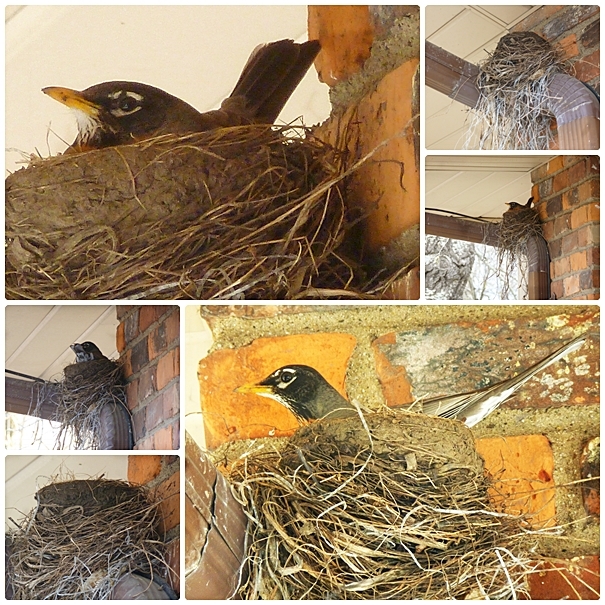 Adorable shots of the Robin and nest! I hope the nesting goes well. Thank you for linking up to my critter party. Have a happy weekend! She was persistent and mother's usually know best! Hope all goes well. Happy Critter Day. How sweet. I wish her good luck. Wonderful shots of the robin in nest. I hope they will be safe. what a cutie! i hope she has a successful brood! Oh, how cool to have her nesting so close! How exciting and it will be great when the babies are born. What lovely shots of the robin on her nest.